A quarter of a century ago, Ken Shamrock was part of a revolution in combat sports as a competitor in the first Ultimate Fighting Championship event in Denver on November 12, 1993. It wasn’t exactly what he expected to happen at McNichols Arena. Future UFC Hall of Famer Davie asked this other future Hall of Famer what his credentials were. Shamrock, who was making a name for himself as one of the top competitors in Japan’s Pancrase promotion, filled Davie in. After a short wait, Davie got back to Shamrock and let him know that he was in the eight-man tournament. There was no jumping for joy, no setting up a two-month training camp. In a classic case of “don’t quit your day job,” Shamrock went back to Japan and back to work, submitting Takaku Fuke in 44 seconds on November 8. That’s not a typo. Once back in the States and in town for the UFC 1 press conference, Shamrock wasn’t too impressed. “I see all these guys there and they all did not look like fighters to me,” he said. “Some of them should have been in a rocking chair, drinking a beer, and other ones looked like they shouldn’t be in a sports event at all, which was Royce Gracie. So it was definitely something I did not expect.” It was immediately clear, though, that if we were going off looks alone, Shamrock was going to tear through the tournament and pick up the big check at the end of the night. He was built like a Hollywood action hero, he talked the talk and could walk the walk. That aura of being “The World’s Most Dangerous Man” made him a rising star in Japan, and it was about to do the same thing in his home country. That attitude wasn’t an act, either. It came from a place built on a lifetime of fighting where there really were no rules. Matched up with Patrick Smith in the first round of the tournament, Shamrock watched with his fellow combatants as the opening bout saw Teila Tuli lose his tooth and a fight courtesy of a Gerard Gordeau kick in just 26 seconds. Shamrock loved it. Some of his peers, not as much. Shamrock’s first fight saw him finish Smith in less than two minutes. In the semifinals, he met another fighter who eventually entered the UFC Hall of Fame in Gracie, and their long-time rivalry began with a 57-second submission win by the Brazilian grappling master. 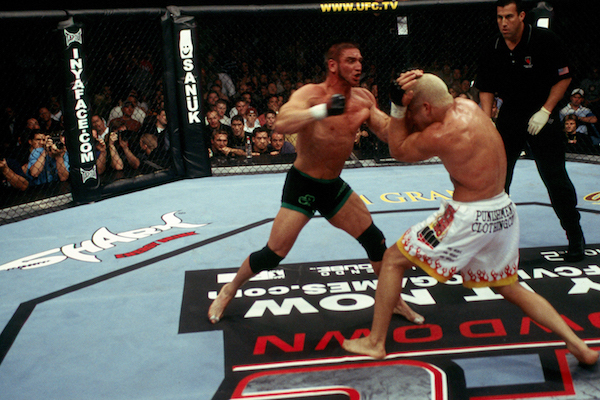 Over the coming years, the world got to see what Ken Shamrock was about. In addition to continued success in Japan, where he competed for both Pancrase and PRIDE, he also went 5-1-2 in his next eight UFC bouts, earning the Superfight title with a 1995 win over Dan Severn. A run in the WWE took him away from the sport for a few years, but his return included participation in some of the biggest fights of his era, including PRIDE 19 against Don Frye and UFC 40 against Tito Ortiz in 2002. Not surprisingly, Shamrock earned his place in the UFC Hall of Fame in 2003, and his pioneering run in the sport won’t be forgotten. But does he believe that there would even be a sport to talk about today if he had won that first tournament in 1993 as expected? “I do,” said Shamrock, 54. “They had other people in the wings like Rickson Gracie, that if Royce was to lose, they would have come back with someone better. I think Rorion (Gracie)’s idea was to show the world that smaller guys could beat bigger guys. And on TV, Rickson doesn’t look like a small guy, even though he is by stature. But he’s muscular. So Rorion wanted this visual of somebody that wasn’t this intimidating figure who would beat all these guys that were bigger. But if that didn’t happen, he had Rickson standing in the wings waiting to jump in and rectify the situation. Through the ups and downs, the sport hasn’t just survived, but it’s thrived. Ken Shamrock has played a big part in that.